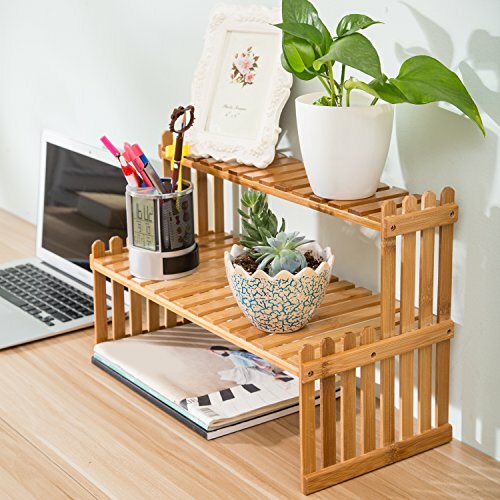 Display of your favorite small potted plants or other miscellaneous decorations on this stylish bamboo rack. This display stand features 2 tier bamboo wood slat shelves making it perfect for displaying outdoor patio items such as plants and gnomes, but it can also serve as a sweet indoor display stand as well. Give this as a charming and useful gift for weddings and other events, or keep it in your own household to bring an elaborate modern edge to your decorations. Approximate Dimensions (in inches): 11.75 H x 18.25 L x 8.25 D.
A decorative bamboo display stand sure to bring charm to your living space. Features 2 tier slat shelves perfect for displaying small potted plants, books or other knickknacks. Perfect for displaying items on a desktop or tabletop.